We are happy to introduce RESTx, a new open source project from MuleSoft. We believe that RESTx is quite simply the quickest and easiest way to create RESTful resources and RESTful web services in your enterprise or in the cloud, to integrate data and to make your data ready to be integrated. We invite you to find out more about it, view case studies, download it, and try it out. We think you will be surprised by how quickly and easily you start being productive. With RESTx your organization gains speed and agility: It allows your developers to provide custom data access and integration code – in the programming language of their choice – while your users are empowered to rapidly create new configurations for this code, making it work in ways that are meaningful and relevant to them. RESTx gives your users the ability to quickly and simply create new, unique, reusable data sources – called RESTful resources – they can share, incorporate and use, without every time having to involve IT or the developers. What is a RESTful resource? It’s data you can interact with in a RESTful fashion: Addressable via URIs, fully discoverable just by following links, able to interact with a web browser, suitable for imports in spreadsheets, useful as building blocks for mashups or easily accessible by client application. 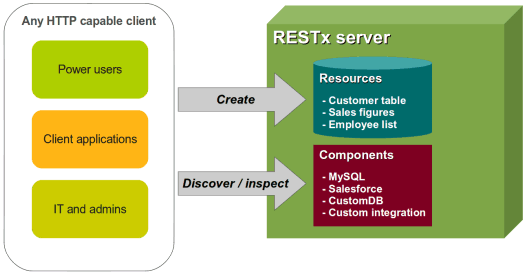 RESTx allows your IT department and administrators to provide and provision components on the RESTx server. Components are blocks of software, implementing specific functionality: Access to databases, SaaS offerings, proprietary or legacy file formats and APIs, integration logic specific to your organization and needs. Most serious data integration projects sooner or later require custom code. Therefore RESTx makes developing components easy. So easy, in fact, that your developers will be productive within minutes. The component API is provided for multiple languages (Java and Python for now, more languages to follow soon), which allow your developers to chose the language they are most comfortable with, or which is best suited for the task. The API is simple and light weight: It does not restrict developers or force them into a particular line of thinking. Instead, it gets out of their way and gives them the freedom to focus just on implementation. Building and deploying components is done with just a single command. Rendering output data into the content type requested by a client is taken care of by RESTx: A web-browser may need HTML, while another client application would like the same data in JSON. The component developer does not need to worry about it. Developers determine which parameters and services (functions or methods) are exposed by each component. When users access the server – for example with a web browser – they can browse the available components, see exactly which parameters they need and what services they provide and so determine whether this component will be useful for them. They can then provide a new configuration for this component: Values for the parameters exposed by the component developers. For example, developers may have provided a component to access a legacy application. A query string is exposed as parameter. Users with the right knowledge and credentials can now create RESTful resources for the data they need, by applying specific query strings as configurations to the component. Creating those resources just takes seconds. In fact, if you access the server in a web-browser, you can do so just by filling out a simple form. The server stores these new configurations and returns a compact, easy to use URI, which can now be passed around and shared. The details of the utilized component and the query are hidden. Therefore, the resource URI is suitable for access even by business partners or customers, keeping them isolated from changes to queries or the underlying infrastructure. When the resource URI is accessed, the server loads the stored configuration and applies the configuration before executing the component code. Once resources are created, they can easily be used from with components to express data integration logic. These components, of course, are equally suitable as the base for further RESTful resources. Give developers the means to quickly and easily create custom data access and integration code in the language of their choice. Give users the ability to easily create and store re-usable, shareable configurations for this code, which gives them the data they need. See how this simplicity can help your organization. Download RESTx and be up and running in just 5 minutes. RESTx is fully open source, licensed under GPLv3: You can find the code on github. We warmly welcome contributions. Please feel free to get in contact with us or check out our issue tracker. We are happy to introduce RESTx, a new open source project from MuleSoft. We believe that RESTx is quite simply the quickest and easiest way to create RESTful resources and RESTful web services in your enterprise or in the cloud, to integrate data and to make your data ready to be integrated. We invite you to find out more about it, view case studies,download it, and try it out. We think you will be surprised by how quickly and easily you start being productive.